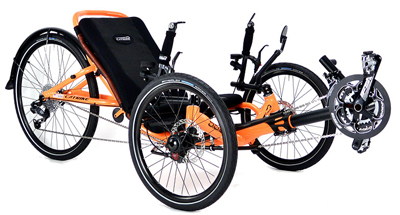 The Catrike 5.5.9 is a quick folding touring trike, with Catrike’s excellent parts spec, wide color options, and value-driven price. 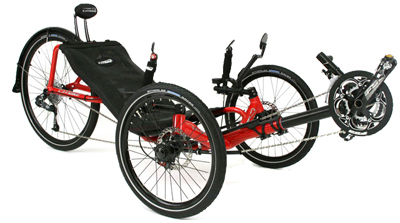 The folding 5.5.9 is a folding Catrike, similar to the Trail, but it is geared for speed with a 26″ rear wheel and sits higher, using the higher handlebar set standard on the Villager. 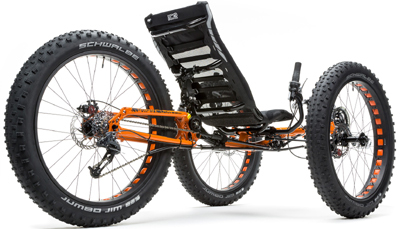 Do you need a 26″ rear wheel? If you are the sort of person who likes to get to the top of a hill and pedal down to see how fast you can go then you’ll want the higher gearing. The seat angle on the 5.5.9 adjusts from 44-51°, which is more upright than many Catrike models. When folded, the 5.5.9 stays in one piece, with integrated dolly wheels to help you move it in the folded position. The seat back folds forward and the rear section tucks up under the frame. 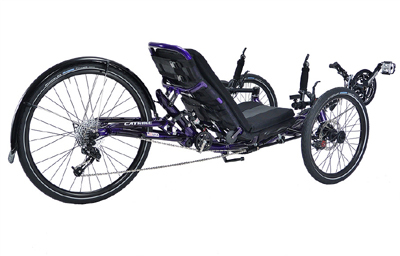 The 5.5.9 is a premium Grand Touring Catrike. Experience high performance and spirited long-distance rides with extraordinary comfort.